Fruit of the Earth CBD tinctures are dietary supplements in liquid form with a potent cannabidiol (CBD) and ancient herbal blend content. Our tinctures can be taken orally (either directly ingested or sublingually), or mixed with your favorite beverage. 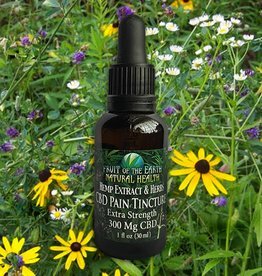 Fruit of the Earth tinctures are highly concentrated to promote rapid relief from pain, while also providing bio support to targeted areas for specific health-management issues. Ingredients: 300 mg CBD from Organic Hemp, St. John's Wort, Skullcap, Lemongrass, Kava Kava, Passion Flower, Licorice Root, Damiana, Lavender, 5HTP, Lemon Balm, Rose Petals, Organic Vegetable Glycerin, Organic Alcohol.